This may not be the best UK film of the year, but for anyone who was alive in the late 1960s/early 1970s in London it will probably be the most enjoyable. In fact, I’d say that the first 40 mins of the film is the best British Cinema of the last few years and even if you’ve never heard of Dr. Feelgood, you should get a lot from it. Julien Temple is famous as a maker of both fictional and non-fictional films about the UK music scene. This film is his documentary about Dr. Feelgood who stormed out of Canvey Island to take on the world in 1972. 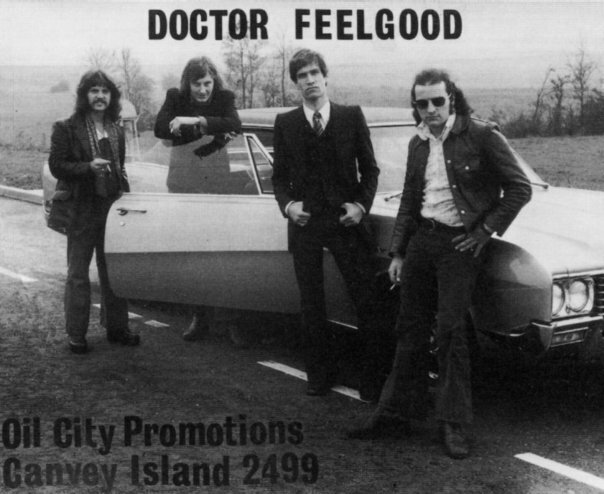 For those outside the UK, I should explain that Canvey Island is an island in the Thames Estuary, famous for a Shell Oil Refinery, a tacky seafront and beach – and Dr. Feelgood. As the film points out several times there are some uncanny parallels between the island and the Mississippi Delta region. From my few forays into deepest Essex I can attest to the unworldly atmosphere of the region and it isn’t so surprising that two such charismatic (and slightly deranged) characters as Wilko Johnson and Lee Brilleaux should be born there. All four members of the band lived within a few streets of each other and the film scores big points by using the dramatic footage of the 1953 floods which caused havoc in low-lying areas across all the coastal regions of Northern Europe. What comes across very strongly is that these were absolutely typical English lower middle-class kids who found themselves growing up in a distinct environment at a special time. The sense of being slightly odd compared to kids of the same age in suburban London perhaps explains why they were into proper R & B when far too much of British youth was wasting its time with prog rock. This meant that the Feelgoods were at home in the pub rock scene of the early 1970s and could be seen as a form of ‘pre-punk’. Temple’s strategy is to build the film around the still riveting presence of Wilko Johnson, now without the hair and marginally less manic, but still highly entertaining. The other two band members fill in with details and Lee Brilleaux, who died in 1994, appears in archive footage and through the memories of his American wife and his sparky mother. ‘Witness statements’ are then mixed with lots of archive footage from the lads’ childhoods, from performances by the band and by some added dramatic reconstructions. Finally and most controversially, there is a very liberal use of archive footage from British film and television series of the 1940s and 1950s. I’m not sure what to make of this. In small doses it is very interesting – working to dispel the ideas that nothing happened in British Cinema in that period and providing an interesting commentary on the kind of world the lads were coming from. But I did feel (as have others, I notice) that there is too much of it and sometimes it just becomes silly. The stories about Wilko Johnson as a secondary school teacher are weird and wonderful enough without illustrations from the TV series Whacko! from the 1950s. The main films that are used include the They Made Me a Fugitive (1947), Brighton Rock (1949), The Criminal (1960), Payroll (1961) and Robbery (1967). I’m not sure why the Feelgoods have to be linked to gangsters and spivs, but at least it gives the documentary a different feel – a gritty texture. I confess that I’ve not watched a Julien Temple film all the way through before, but I think his instincts are generally right on this one. I don’t remember going to see the Feelgoods (but I might have done) but I remember them well nonetheless. I’m surprised that they weren’t better known. Can somebody please do a similar job on the Kursaal Flyers now? This entry was posted in British Cinema, Documentary. Bookmark the permalink. Spot on write up… loved the Flashman reference. Watched it last night, enormously engaging and enjoyable. Wilko was great – witty and erudite, quite a contrast from his stage persona. One of the best music documentaries I’ve seen. Did you see Temple’s film about post-industrial Detroit? He used many of the same techniques as in this film. Like you I didn’t really think the gangster films added much (apart from some clunking metaphors). The only one I recognised was ‘Night and the City’. There was a film about the Kursaal Flyers – ‘So You Wanna be a Rock ‘n’ Roll Star?’ – which was apparently the inspiration for Spinal Tap.. Thanks for the Kursaal Flyers reference Tom. I wasn’t aware of the BBC Doc that Mark Kidel produced. Since that was a contemporary doc (in 1975) it’s not quite the same as looking back at an era and a specific music genre. Were you ever a reader of ZigZag magazine? Yes, I used to read ZigZag during the punk era. I’ll have to go into the loft and look for my collection (if I’ve still got it) – I think the mag might have changed in the late 1970s. Couple of additional comments now that I’ve caught up with the film. Fully agree with all the positive views – very enjoyable. I did see the group twice, most notably in 1975 on the Naughty Rythms tour when they dominated the show (others were Chilli Willi and Kokomo). They were a breath of fresh air at the time and a great stage act. The references to Canvey Island often mentioned Shellhaven refinery but long forgotten is the fact that it was home to the UK’s first LNG (Liquified Natural Gas) terminal in 1959. At the time there was concern about the safety of LNG so perhaps it’s no surprise that Canvey Island was considered ‘remote’ enough to be an acceptable location. 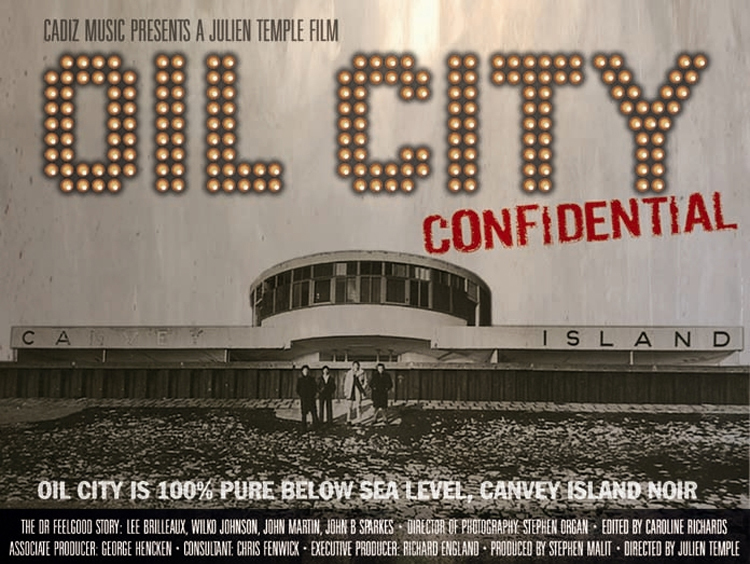 Some excerpts from the Kursaal Flyers’ documentary (‘So You Wanna Be A Rock ‘n’ Roll Star?’) were used in Oil City Confidential. Thanks for this Nigel and for alerting us to the Facebook page for the Kursaal Flyers.